I think I really went out on a limb trying to be original and a little different from the norm on the head design. The head had to be long because the deflector dish is on the top of it for alt mode, so I went for a majestic alien look with a mix of Geordi's visor, Vulcan ears, and Andorian antennas. I was going to paint the antennas the same blue as some of his bot mode details, but I feared that might make the already odd head confusing. I know it isn't perfect, but I hope you guys like it! Knowing the war with the Borg was nearly won, Picard was on a mission far from home to eliminate any known remaining Borg when the Enterprise E happened upon a strange and unresponsive Borg cube. An away team was sent, and returned with the unusual news that all systems except life support on the enemy ship were down, nothing was moving, and the structure of the ship altogether had differences that did not register as Borg technology. In fact, whatever this tech was, it wasn't in the Starfleet database yet. The team retrieved the Borg primary computer core module and a strange metal relic with alien runes etched across it, which was assumed to be part of the new tech the Borg must have assimilated that caused their shut down. Before leaving the area, the disabled ship was destroyed. It took a surprising number of quantum torpedoes and phaser streams to finally do so, as the cube seemed to self repair at an alarming rate. 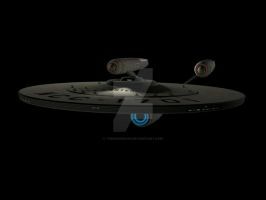 Within a few days, the Enterprise crew had deciphered enough of the Borg computer data to get the coordinates of the relic's origin, and a course was set at warp 9 to reach a never before explored sector of space. With any luck, they would locate a new planet with life and find out just what the Borg were up to. The journey was long even at top speeds, and over the days the crew began to report odd structural changes in various locations all over the ship with no one claiming responsibility for any of them. Geordi confirmed that the entire ship was indeed changing, but it all seemed to be upgrades. Everything new that appeared was made from an incredibly strong unknown metal, quite similar to the alloy the relic itself was made from. Picard feared the alien device might be attempting to take over the ship so he ordered it jettisoned immediately, but none of the doors to airlocks or transporter rooms and controls would open. As the crew tried to stay calm and analyze the situation, the ship eventually shut down completely. Only life support and artificial gravity remained. And then everything simply came back online. Picard was back in control, and everything seemed somewhat back to normal aside from the obvious improvements. Communications were still down and the computer seemed to now be possessed. Both Picard and Riker had many questions for the entity inside the ship's computer, but it would only say "I will protect you. You must reach Cybertron. ", over and over. With little other choice, they resumed their course. Arriving sooner than expected, the Enterprise came upon an entirely metal planet which was surrounded by over a dozen Borg cubes. Knowing there was little chance to defeat them alone, the Captain tried to change course and go to warp, but the ship would not respond. A powerful rumbling voice over the ship intercom said, "Trust me, friends", and suddenly everyone in the saucer section was teleported to the main body of the ship. The captain and high ranking crew members found themselves in their respective positions on a new and improved battle bridge. Everyone braced themselves as the ship shook and jolted, its parts moving around to a drastically new configuration as the Borg ships closed in and opened fire. Soon, the Enterprise had become a enormous humanoid robot, easily dispatching the Borg ships one after another. Some vessels were cleaved with the plasma blade on its right arm, and some crushed into one another by the huge shield mounted on its left arm. Others were destroyed by the phaser banks in the giant space robot's eyes and quantum torpedoes that fired from its right shoulder and chest. The bridge crew witnessed on screen the amazing show of power until not one Borg ship remained. There was no doubt now, the ship was alive, and was a more than welcome ally to the Federation. "Who... are you?" Picard asked. The voice over the intercom answered him. "I am NCC-1701-E. I am the Starfleet Sovereign class ship, Enterprise. I am... an Autobot." "Autobot E, then" Riker said with a sly smile. This is awesome looking! And I really like the story. Tell me, what's his personality like? Picard-ish? Or Riker-ish? Or other? Honestly I didn't think any further than what I wrote, but I would say a unique personality not based on any other character. And since it speaks as the ships computer did, but fully sentient, I suppose it'd be called a "she", as I think the ship generally always was anyway. Yeah. Going by how he talked about his ship I think Picard always looked at the Enterprise as sort of a caretaker to him and his crew, carrying them through the stars, protecting them, keeping them comfortable, and storing their valuable discovery data. As an autobot, I suppose it would be more like a protective mother figure to him and the crew. Picard would have to stay in command of the ship or I don't see the situation working out well, but at times I think he could feel comfortable with letting her take over to get them all out of nasty situations safely. There's an actual Star Trek/Transformers crossover coming soon, or so they say. Yep, a comic book done in the G1 and TOS cartoon style. This is, quite literally, the most awesome thing I've seen all week. Well, it looks like Captain Picard and his crew have a new ally. I like it too..How can we get 1 on of this? thanks. You'd have to commission me to make another one. Alright, how can i get one? Well, I'd take a commission to do one but a lot of people have asked me about it and they always seem to be shocked to find I won't work for hours every day for a month for around 40 cents an hour. how much are we talking? 20$? 30? No of course not that much. $10. Holy crap that's awesome man! Blew me away that it actually transforms too! How did you make something like this? Did you make the parts all from scratch? A model kit, a Skyhammer toy, and tons of styrene and sculpt. It was so much work and in the end the $500 I made on it was a bit depressing. Only sold it because I really needed the money, then later it practically went viral, making it even more sad that I didnt make what it was worth to me, or worth for the work I put into it. It'd take at least $800 for me to make another. But people asking me to give them a price to make another of these don't seem toconsider how much work and time it takes, and think I'll pop one out for $50 or so. The one pictured here sold for over $500, and that was depressingly low. I wouldn't do another for less than $650. Actually, I was going to ask if you could make Starscream into a Romulan Mogai Ship or Scorpion Fighter from Star Trek/Star Trek Online and what the price would be, especially if it's the Starscream they released recently that had the old Movie Crown and (plastic) Cape. I picked those two because Romulans tend to be backstabby like him and the form of those two craft fit his transformation to "jet mode" better than the TOS Bird Of Prey. That sounds awesome, and fun to do, though also a lot of work. I love both of those ships, but the Scorpion fighter craft would be too small to make Starscream into I think. It would take that MP Starscream figure and a similarly sized model of the romulan ship, which I'm not even sure exists. Otherwise I could do it just using styrene and sculpt, but that'd be much more work, would probably take a couple of months to build, and would cost about the same as I'd charge for an enterprise transformer. Right. PM me later plz. It will take a few months (got to pay College, etc), but I would like to negotiate starting paying you for the project. Sure, just email me at tjwilferd@yahoo.com whenever you are ready. If somebody paid me enough, probably. how much would you ask for this? And where can I by this sweety???? Oh it was sold long ago... sorry.